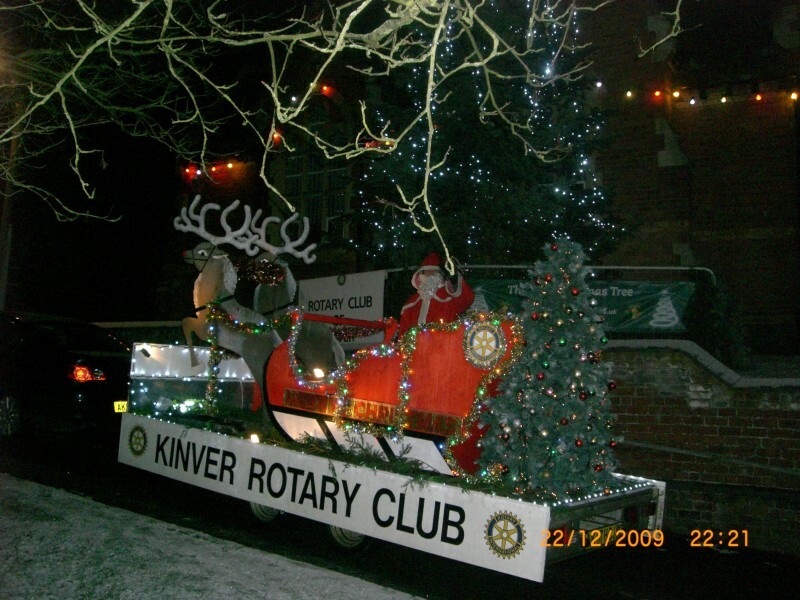 Despite being hit by the pre Christmas deluge of snow which forced the cancellation of four nights’ Santa tours, Kinver Rotary Club’s Christmas sleigh raised more than £5,000 for needy causes in Kinver, Wollaston, Enville and Wall Heath. Fortunately the club was able to visit its newest locations – Doulton Brook in Wollaston and Aldi at Kingswinford/Pensnett before the snows arrived, so mitigating the deficit on the annual collection. Members began the sleigh tours in the knowledge that their fund raising activities over the preceding weeks had raised more than £11,000. Final figures from the 10k Sheepwalks Shocker reveal that Action Heart received £6,600 with a further £307 going to Kinver Fitness Collective from the associated 2k family event while the annual Children in Need quiz hosted by Voice of the Balls Alan Dedicoat netted £1,125 . The club’s harvest auction put £1,273 into its general charity account, a whisky tasting evening raised £752 for the Place2B charity and a music evening organised by the club’s international committee resulted in £982 being earmarked for overseas charitable works. If you enjoy organising or taking part in events to assist those less fortunate than most, quizzing, listening to music, appreciating good whiskeys or merely enjoying some fine fellowship with like-minded people contact Kinver Rotary Club membership secretary Tom Bryson on 07541 449807. Nick Owen is known to many in the Midlands as the face of the news on Midlands Today most evenings, but he’s had quite a career. Amongst his highlights, he’s presented TV-AM, Good Morning with Anne and Nick and he’s chairman of Luton Town Football Club, but that’s just scratching the surface. Oh yeah, and he lives in Kinver and, well, this is KinverOnline, so it’s only proper I speak to him! It seems you’ve had a passion for journalism all your life, I read that you even started your own newspaper while at school. Was there ever a backup plan? Was it a career your parents wanted you to pursue? It was nothing to do with my parents. As I studied Latin, Greek and Ancient History at university, I think they envisaged the law or teaching for me. I have always loved news and read the papers avidly from an early age, so it was no contest in the end. You’ve written for newspapers, presented on radio and you’re most well-known for your TV work on Midlands Today, is TV, then your passion? I love writing and I do loads of it for my job in television. I write everything I say. I also write speeches and give talks on cruise ships – all this involves sitting down and writing. TV is my first love because it is what I have been involved with longest, 37 years and still going! You hosted “Good Morning Britain” with Anne Diamond, a massively successful show during the early days of breakfast TV programming. Out of the many guests you had on the show, who was your favourite? And did you have a nightmare guest that you just wanted to leave quickly? My favourite guest was Eric Morecambe. An absolute gent with a terrific sense of humour ( obviously!). Some actors could be very hard work, though! A bit later you hopped channels and hosted “Good Morning with Anne and Nick“, was this a case of the BBC ‘poaching’ you so you could recreate the success? Yes, I think the BBC believed at the time that a topical magazine show was the best programme in mid morning. They decided to change it, though, after 600 programmes which was bitterly disappointing. We had up to 15 million watching us each week. Are you willing to say which show you preferred presenting?! Difficult to answer, but mid-morning was easier because I didn’t have to leave home around 3 am every day! Even so, it was still an early start, getting to my desk by about 6.30 . I was ten years more experienced by the time I did the mid-morning show so I probably enjoyed and appreciated it more. There was definitely an “Anne and Nick” or “Richard and Judy” divide, especially amongst students, were you aware of this at the time and is it a shock to you that students were up early enough to watch either program?! Ha! I was aware of Nick Owen Appreciation Societies all across the country at various universities! Yes, I realised there was a divide, but didn’t give it much thought – I just got on with the job! During the early days of Good Morning, you worked with many who have gone on to become household names such as Ainsley Harriot. Do you keep in touch with them? And would you follow Ainsley on to the Strictly dancefloor? I see Ainsley occasionally and we have text contact, but no…I would definitely not do Strictly! I would be hopeless and would hate the scrutiny. I turned down the Jungle a few years ago! I am still in touch with a number of old colleagues. You’ve been a critic of huge salaries for news presenters after Susanna Reid was paid £1Million to move to TV-AM, do you think this was a case of ITV trying to “buy” viewers? Susannah Reid is actually not on anything like a million. I wasn’t talking about her at all when I was asked for my thoughts on what was the problem with ITV’s breakfast show these days. I was thinking of Adrian Chiles and Christine Bleakley who had originally had the boy and girl next door image, as Anne and I did. Their relationship with the audience changed once they were elevated into the superstar millionaire class. On to football, Frank Skinner says in his autobiography that you should support the team you’re born closest to, so why Luton Town and not Tring?! Good point, but I was born in Berkhamsted in Hertfordshire so perhaps I should support them too! I was, in fact, a vice president of Berko and there are three seats in the stand with my three sons names on them as a sort of sponsorship deal back in the late eighties and early nineties. My father used to go to Luton and I naturally followed nearly sixty years ago now! You’ve obviously got a passion for the sport, and Luton in particular. The directors are obviously also behind the team having put so much money in to keep it going and aid its promotion back into the football league, but in the higher leagues, 12 million seems small change, do you think the Premiership can continue as it is with the incredible amounts of money flowing around? Does change need to happen? I dread to think about the future of the Premier League. The money being spent now and the amount that will be spent in the future is almost beyond comprehension. I fear that top clubs are becoming further and further removed from the real world and the real fans. They don’t seem so rooted in the community any more. Luton are currently mid-table in league 2, what do you think the chances are of doing a “Wimbledon” and soaring to the top ranks? We were there before so we can get there again, we won the League Cup against Arsenal in 1988,but we need a new stadium first and that is on the horizon. We have a huge catchment area and are well placed for the airport and motorway. Our fan base is good now – I am sure it will increase enormously when our facilities are amongst the best in the country. Closer to home then, you’ve been spotted walking around Kinver for a while now, what first attracted you to the village? I came here because it is my partner Vicki’s home and I love being here. How are you finding life here? Are you constantly being stopped in the street? Everyone is very friendly, Vicki has a lovely family and the country walks are terrific. Perfect! Have you met Robert Plant yet? He’s a regular in the Co-Op! Robert and I used to play in the same football team, ATV All Stars. I was the winger, with him and Jasper Carrott as twin strikers. It was a brilliant time. And, yes, I have seen him at the Co-op, as well as at events around the region. And finally, is it true you were the commentator on the first series of Bullseye? Yes, I did the voice overs for the prizes, I seem to remember! Not sure how many shows, though. I was also a special guest on one of them too. Thanks to Nick for taking the time to answer the questions!